It's summer & I have some time to tend the garden, clean out the sheds & plan for classes and garden planting for the coming school year. 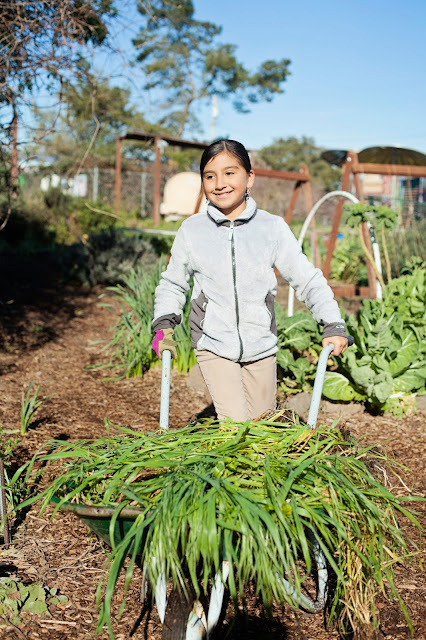 Planning a school garden is different from planning a home garden or a farm. I want the plants to be exciting and interesting and beautiful to the students; Ideally I want to be able to plan multiple lessons around each plant; I want some plants to be familiar and some to be surprising; I want hearty plants that can recover when kids bump into them or step on them accidentally! This year we planted three types of gourds -- Apple gourds, Corsican gourds & Speckled Swan gourds. We'll use these gourds once they've matured and dried, to make birdhouses, bowls and musical instruments. Gourds have been discovered in archaeological sites dating from as early as 13,000 BC, and their history of uses over time and cultures is fascinating. They make great teaching tools & the seeds are big & perfect for little hands to plant. The vining plants have grown well over our garden tunnel & the gourds look so cool as they hang down into the tunnel. This winter we planted six varieties of cherry tomatoes -- cherry tomatoes of different sizes & shapes, colors & tastes. Cherry tomatoes are great in a school garden -- sweet, small & perfect for kids to pick and eat right off the vine. We use them to make salsa & salads, too! 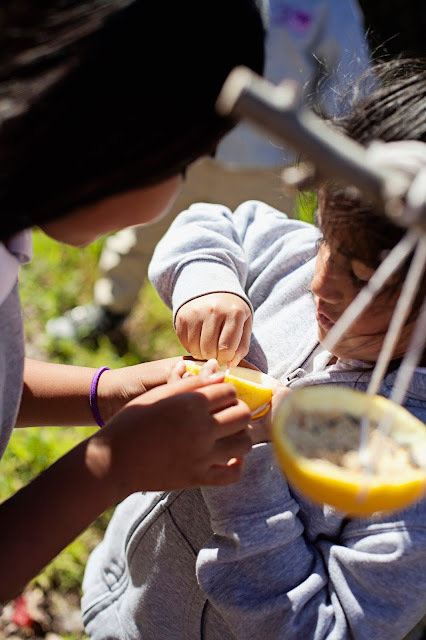 Citrus season brings taste tests, snacks, lemonade making & fresh oj in the garden. With 450 enthusiastic students, our dozen little citrus trees don't stay full very long, though. Here's a sweet project for the last of the citrus -- the bitter oro blanco grapefruit and super sour Eureka lemons that don't get a lot of taste bud love. 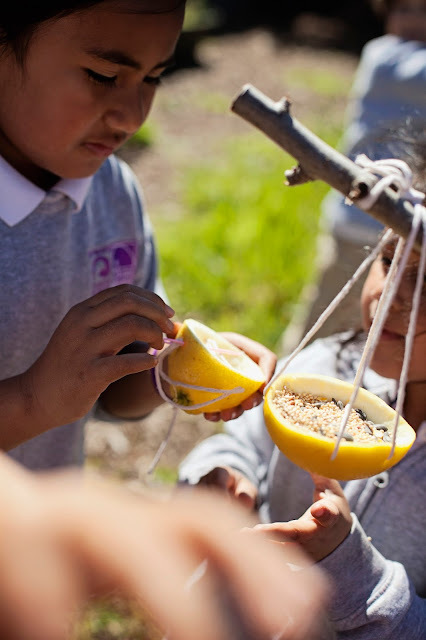 First graders scooped out the citrus flesh from the halved fruits, then used the peel shells to make bird feeders for our garden. Some kids even munched on the scooped fruit! Using plastic needles, the students helped each other thread twine through the citrus shells to make hangers for their feeders. Then they helped each other hang the feeders from the branches of our apple and plum trees. This was a fun, sweet activity... and I loved seeing the teamwork and communication that emerged as students made sure everyone succeeded! Managing the care of a one-acre school garden can be daunting. I love this work, and that makes it easier, but I certainly can't do it alone. Volunteer work days in our garden help keep things in order from season to season, and help tackle projects too big for one person... and bring together awesome people from our community -- and I'm so thankful for that support. 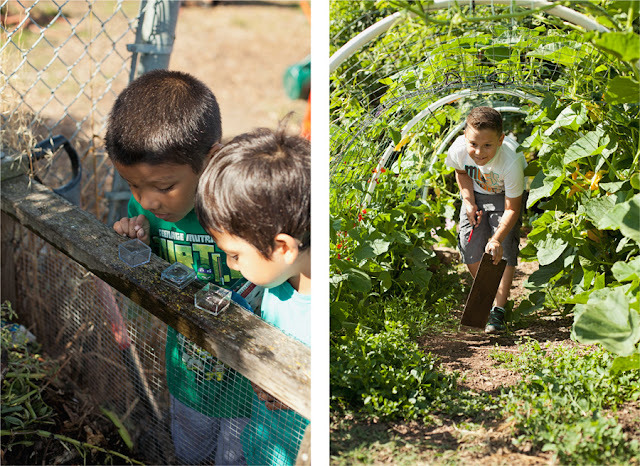 However, I've struggled with how to incorporate the students in the general care and upkeep of our garden -- their garden. 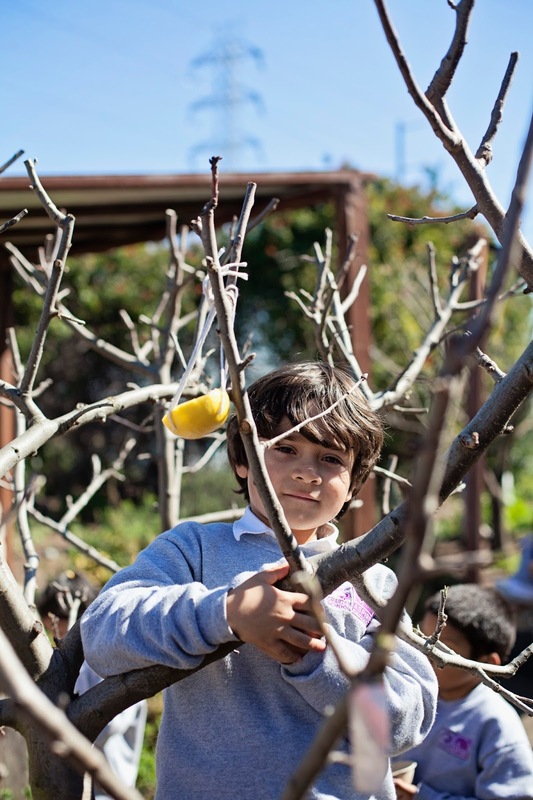 It's hard incorporating 25 enthusiastic children in a work project in the garden without any other adult support (even with additional support it can be a challenge!). Students do help plant seeds, water plants, harvest... but what about bigger jobs like mulching, weeding, turning compost, building structures. How do I get them ALL involved? Well, this school year I decided to make it happen. And it has been chaotic. And joyful. And overall, a phenomenal success. Students LOVE working. They truly enjoy doing hands on, meaningful tasks, and seeing a project's impact in the garden. I frequently explain to visitors and other teachers that it might not look pretty -- it really is chaos... but I'm embracing it, and it's been good. I see my students working together and problem solving, working hard --using their hands, their muscles, their minds. And yes, I see them arguing and struggling, getting dirty and sometimes making poor choices -- it's part of the process. 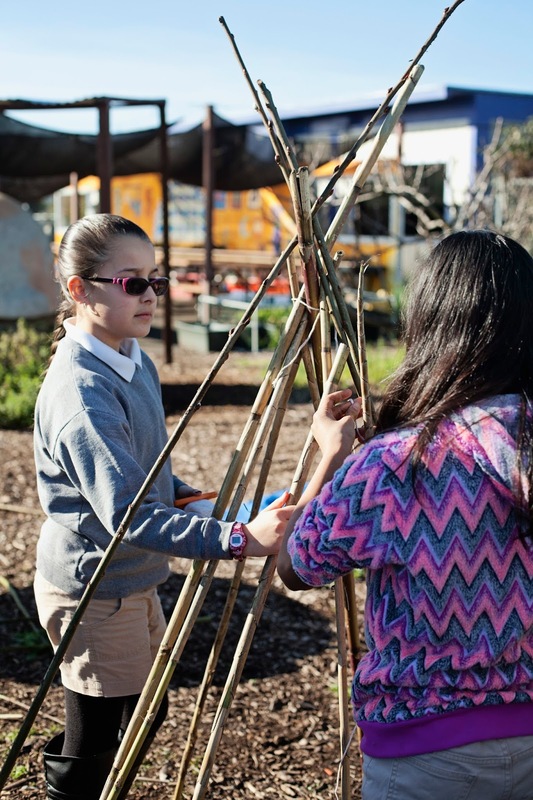 Building bean poles -- to support the Scarlet Runner bean seedlings they have sprouted in the greenhouse. 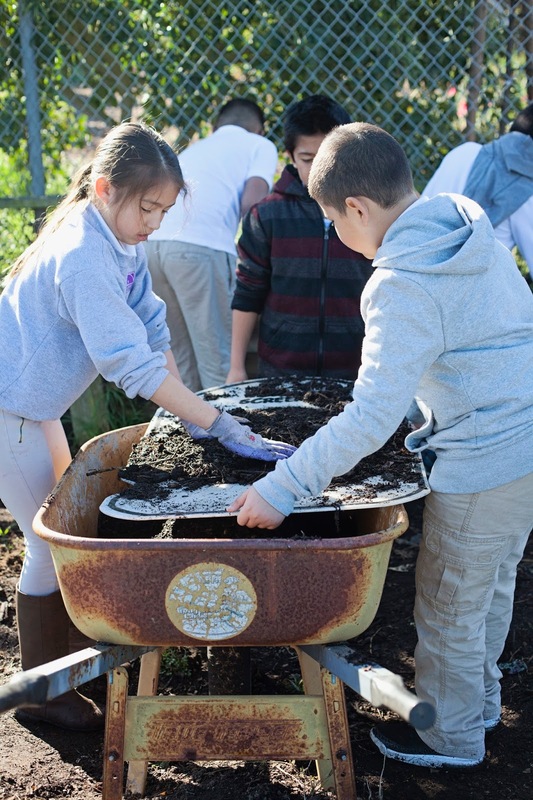 Sifting compost. Next step: spread the compost around our new pumpkin patch area. All the recent rain = SO many weeds! Students worked on weeding the apple orchard. What a bountiful and beautiful autumn it has been! The past two Novembers, I've collected as many leftover or abandoned pumpkins as I could and then I lugged them to school and cracked them open in a dark patch of soil behind the garden shed. So far, so good -- in the spring they've sprouted into healthy, prolific pumpkin patches with enough squash and pumpkins for the students to harvest and use in classroom projects for a few fun weeks in the fall. Students in all my classes love pumpkin picking, weighing and measuring their pumpkins, making guesses about the number of seeds inside & then cutting into their pumpkins to collect the slimy seeds. No-one can resist a roasted pumpkin seed snack or other pumpkin treats, either! 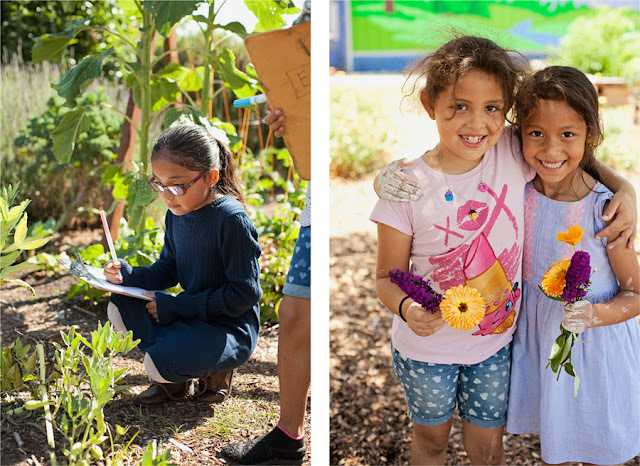 As always, books are a big part of our garden lessons. A few of our favorite pumpkin books include the adorable Too Many Pumpkins, by Linda White, as well as the informative Pumpkin Book by Gail Gibbons, and the short & sweet Pumpkin, Pumpkin by Jeanne Titherington. Continue on to see photos of some of our pumpkin & squash adventures! Garden Library -- with an even greater focus on reading & literacy throughout our school, students now get to enjoy reading books from our budding garden library. Students find cozy, favorite spots in the green dome, teepee, tunnels and under trees to read their chosen books. 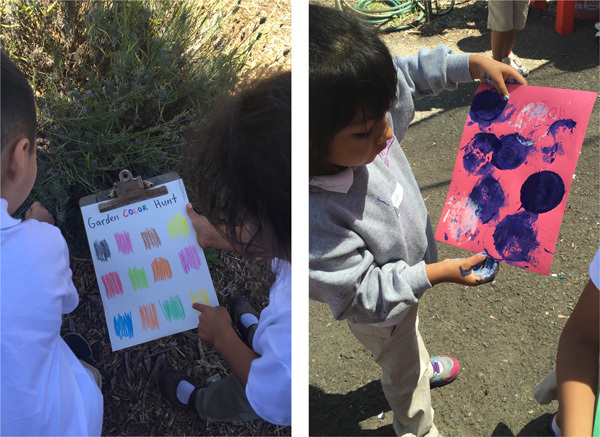 For our first kindergarten lessons, we are focusing on all the colors in the garden. The students toured the garden, ready with their 'cameras' (imaginary!) to snap pictures of all the colors they wanted to remember. On our next visit to the garden, we read the book Mary Wore Her Red Dress, originally a folksong, adapted by Merle Peek. Students helped to add new, personalized verses -- like this one: "Benjamin saw a orange pumpkin, orange pumpkin, orange pumpkin. Benjamin saw an orange pumpkin in the garden." Kindergarteners also went on a color scavenger hunt and shared their favorite findings with each other. We've also been enjoying fresh apples from our garden trees... and we used some of the wormy ones to print with! Looking for colors in the garden. And apple prints! 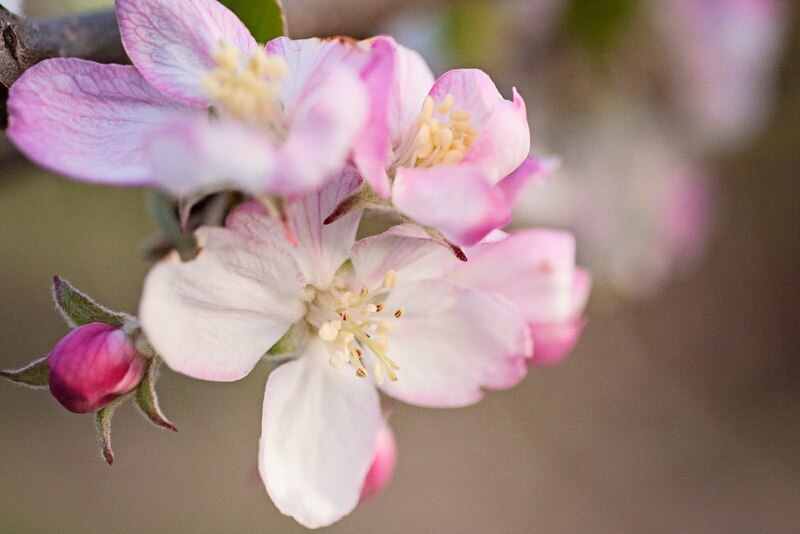 In first and second grade we read The Seasons of Arnold's Apple Tree, by Gail Gibbons, and noticed the changes in Arnold's tree throughout the year. Then we toured the garden to see what changes we noticed since last school year. 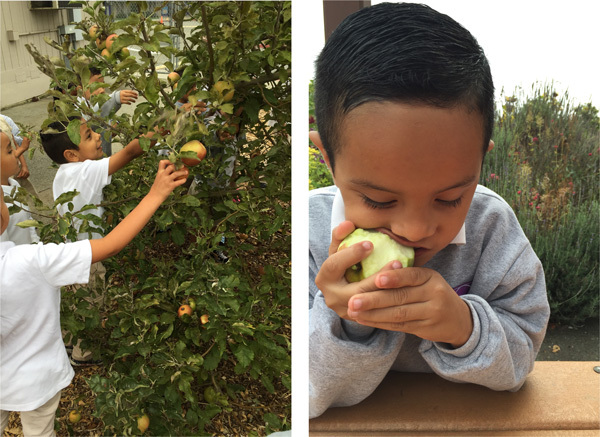 Students picked and ate apples, too! There's more! 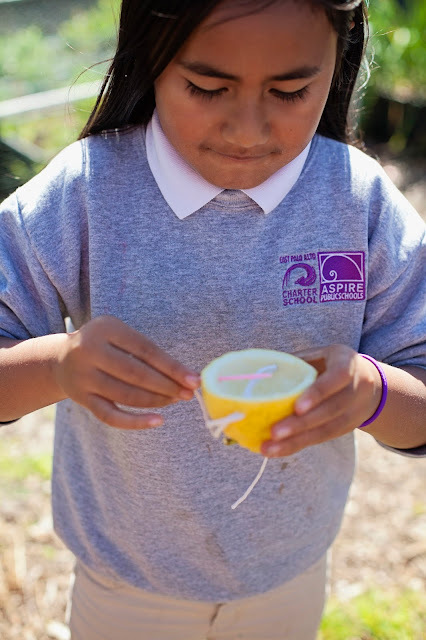 First, Second & Third graders planted radish seeds. 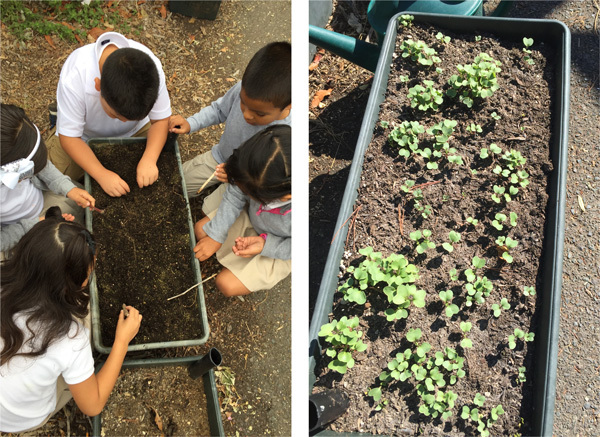 Students who returned to the garden this week were excited to see a big change from last week: the radish seeds have already sprouted! We started our class off with the book Up, Down and Around, by Katherine Ayres. Students noticed how different plants grow, and talked about the plant parts that we eat. The part of the radish that we eat will develop under the ground... just like the potatoes that first graders planted this week, too! We've been busy!! School starts next week & the garden is ready! 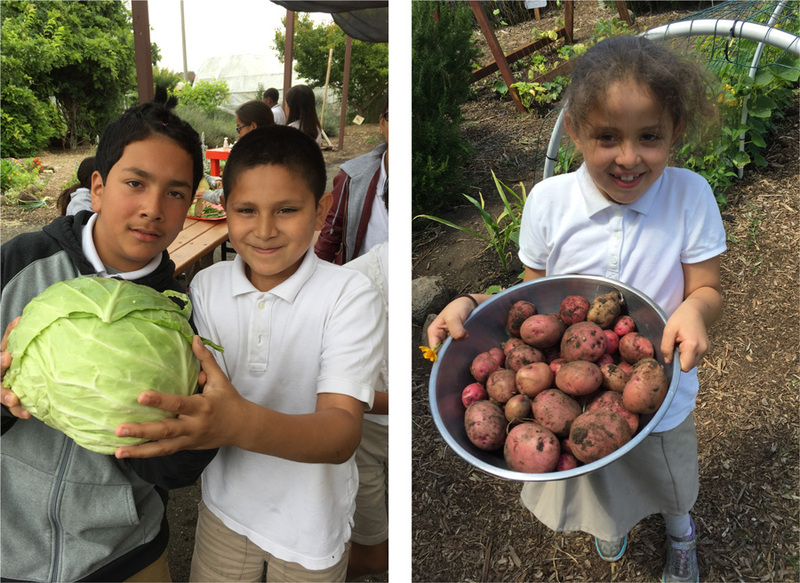 Starting a bit earlier than other schools gives us a chance to use more of our summer bounty. During the 5-week summer vacation we donated over 100 pounds of fresh garden produce to Ecumenical Hunger Program, right down the street from our school. Summer staff at the school enjoyed quite a bit of squash and tomatoes, too! These lovely, petite seedless green grapes pretty much take care of themselves. They've been here at least 8 years! Quince! We'll be making membrillo and poached quince with these guys. I love growing a 'Three Sisters Garden' each summer -- winter squash, corn and climbing beans. The are great companion plants. 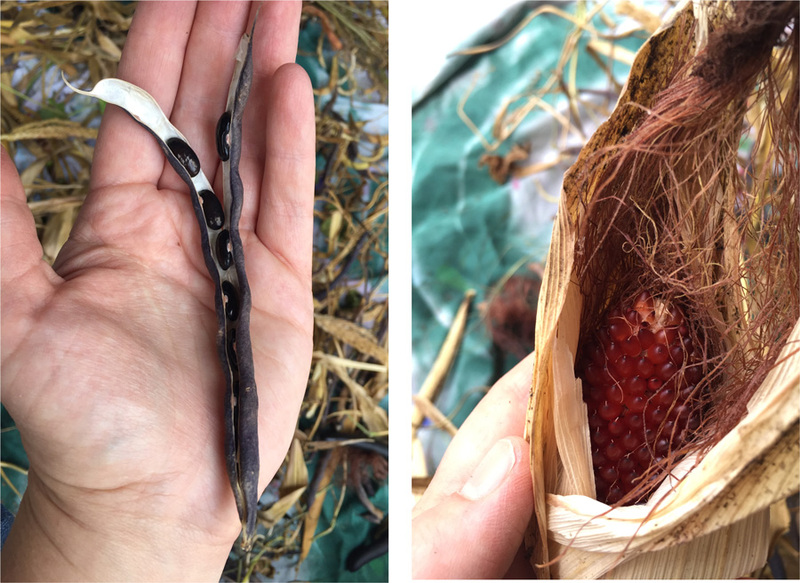 This year I tried Cherokee Trail of Tears bean (on the left) and strawberry popcorn (on the right). Pumpkins, butternut squash and Red Kuri squash climbed on the ground beneath them. These beautiful Scarlet Runner beans were wonderful on our garden tunnel (see below) & trellises. Hummingbirds love the bright red flowers. I let these beans dry so the kids can harvest the vibrant beans & plant them in the spring. One of our fun garden tunnels. This year scarlet runner beans, morning glories, cucumbers and Red Kuri squash covered it with color. A rainbow of produce ready to be donated. Pictured from top to bottom: three types of summer squash, red kuru squash, Cherokee Purple tomatoes, apples, plums, Bearss limes, cucumbers. More produce to donate. Summer squash started to get a little out of hand! There are just seven more school days left of this school year! It is hard to believe. I love that the garden provides an opportunity to mark time by seeing the plants, fruits & vegetables grow. 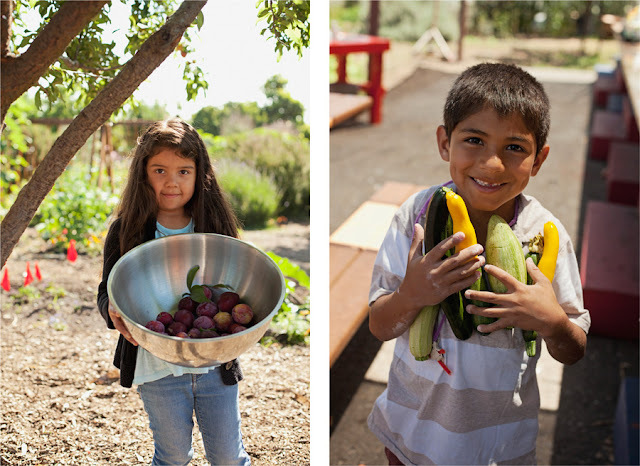 The past few weeks have been full of harvesting produce that has been growing throughout this year. 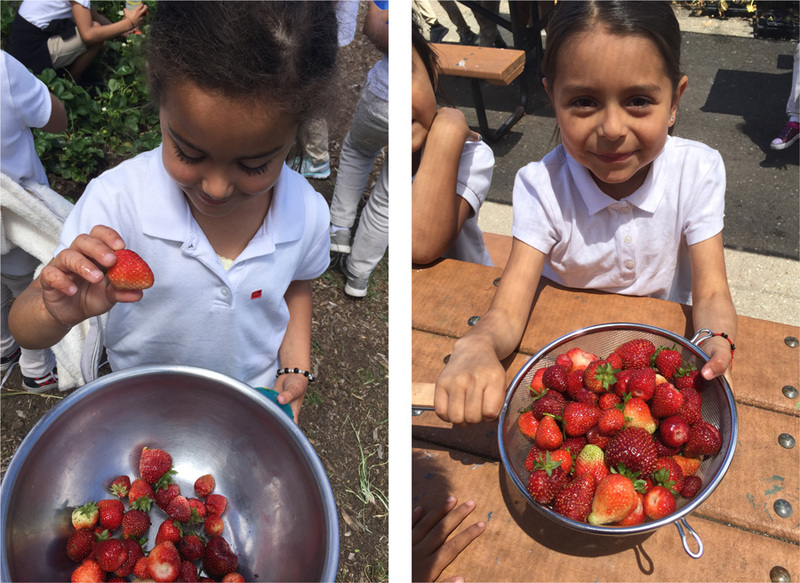 Kindergarteners picked onions and garlic that they planted last October -- and they have been enjoying strawberries that we planted in January! Our garden tunnel is covered with baby pumpkins and ruby-colored bean flowers! Zucchinis are already producing abundantly. The plum tree is dropping sweet, purple plums. It's a pretty exciting & lovely time. I'm an east-coaster living on the west coast with my husband and baby. I'm happy to be growing, cooking, eating and sharing good food. I love seeing a garden's magic & sharing that with children. 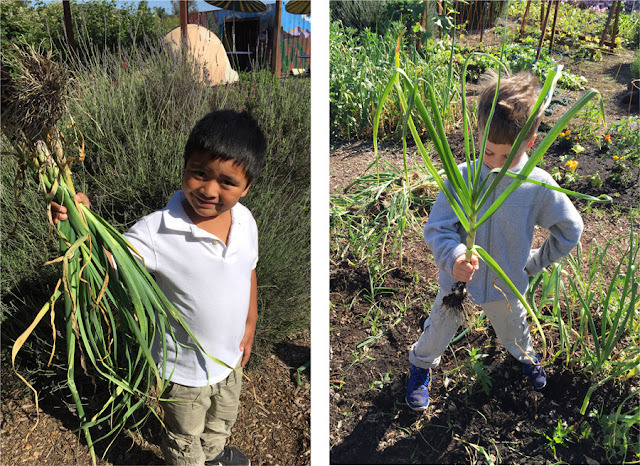 My job as Garden Program Manager at the East Palo Alto Charter School (EPACS) lets me do a lot of the things I love everyday and I'm grateful for that.